A PET-CT scan combines a CT scan and a PET scan. It gives detailed information about your cancer. The CT scan takes a series of x-rays from all around your body and puts them together to create a 3 dimensional (3D) picture. The PET scan uses a mildly radioactive drug to show up areas of your body where cells are more active than normal. You usually have a PET-CT scan in the radiology department as an outpatient. A radiographer operates the scanner. It usually takes between 30 and 60 minutes. These scanners tend to be available only in the major cancer hospitals. So you might have to travel to another hospital to have one. A PET-CT scan can also show how well a cancer treatment is working. After you have had treatment for cancer, a scan may show an area that looks like there might still be some cancer left. This might not be cancer but scar tissue left over from the cancer killed off by your treatment. A PET-CT scan can sometimes show whether this tissue is active cancer or not. For most PET-CT scans, you need to stop eating about 6 hours beforehand. You can usually drink water during this time. You might have instructions not to do any strenuous exercise for 24 hours before the scan. Call the number on your appointment letter if not eating is a problem for you, for example if you’re diabetic. You might need to adapt your diet and sugar control and your appointment time could change. Some people feel claustrophobic when they‘re having a scan. Contact the department staff before your test if you’re likely to feel like this. They can take extra care to make sure you’re comfortable and that you understand what’s going on. Your doctor can arrange to give you medicine to help you relax, if needed. Your radiographer might ask you to change into a hospital gown. You have to remove any jewellery and other metal objects such as hair clips. Metal interferes with the images produced by the scanner. You have an injection of radioactive liquid called a radiotracer about an hour before the scan. You have this injection through a small plastic tube in your arm (a cannula). It's only a small amount of radiation. You need to rest and avoid moving too much during this hour. This allows the radiotracer to spread through your body and into your tissues. 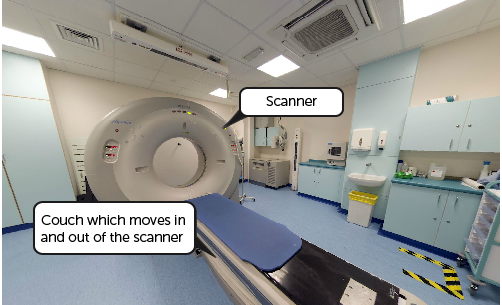 Your radiographer takes you into the scanning room. The PET-CT machine is large and shaped like a doughnut. You have most scans lying down on the machine couch on your back. Once you’re in the right position, your radiographer leaves the room. They can see you on a TV screen or through a window from the control room. You can talk to each other through an intercom. The couch slowly slides backwards and forwards through the scanner. The machine takes pictures as you move through it. The scan is painless but can be uncomfortable because you have to stay still. Tell your radiographer if you’re getting stiff and need to move. It’s not particularly noisy but you’ll hear a constant background noise. When it’s over, your radiographer will come back into the room and lower the couch so you can get up. This 3-minute video shows you what happens when you have a PET-CT scan. Voiceover: PET and PET-CT scans help to diagnose and stage some cancers. They can also help your doctor decide which treatment you need and whether your treatment is working. PET and PET-CT scans show slightly different things but the process of having them is the same. Radiographer: Okay, so first of all I’d like you to get changed. Voiceover: For some scans you should not eat for 4 to 6 hours beforehand, for others there is no preparation. Your appointment card will give you details of what you need to do. One you have changed into your gown the radiographer will weigh and measure you. Then you have an injection of a very small amount of a radioactive drug called a tracer. This is what shows up on the scan. The drug is usually a form of glucose. Radiographer: Right, I am starting now. Does that feel okay? Radiographer: Right, that’s all in now. I am going to take the needle away, because we don’t need that any more. Voiceover: After the injection you rest for about an hour. This allows the tracer to spread through your body. The scan shows up cancer because they use glucose in a different way from normal tissue. When you are ready for the scan the radiographer helps you lie on the couch in the correct position. Radiographer: I am just going to pop this under your knee, just to help your back stay comfortable. You’re going to move in and out of the scanner. Nothing is going to touch you or anything like that. You must keep very still. Close your eyes, because this light is quite bright. Voiceover: Once you are in position and comfortable the radiographer will leave the room. You need to lie as still as possible while you are having the scan. You won’t feel anything, but it can be difficult to lie still for up to an hour. If you begin to feel unwell or want some help you will be able to get the radiographers attention. Radiographer: Are you okay in there, Charlotte? Voiceover: The radiographer control the scan from a separate room, but they will be able to hear and see you all the time you are having the scan and will check you are okay. Radiographer: We won’t be long now. Okay, that’s all done now; we will get you out of there. Are you ok? Good. You can pop your arms down now. Voiceover: One the scan is finished you can go home. As a precaution you should avoid contact with pregnant women and small babies for six hours after your scan. Your specialist will give you the results usually within a couple of weeks. Your radiographer removes the cannula from your arm before you go home. You can then eat and drink normally. Drinking plenty of fluids after your scan helps to flush the radioactive tracer out of your system. Someone will need to take you home if you’ve had medicine to help you relax. You won’t be able to drive for the rest of the day as you might be drowsy. The radioactive tracer gives off very small levels of radiation that go away very quickly. As a precaution, you shouldn’t have close contact with pregnant women, babies or young children for 6 hours after your scan. If you are travelling abroad within a few days of your scan, it may be a good idea to take your appointment letter with you to show that you have had a scan. Most airports have sensitive radiation monitors which may pick up the trace of radiation following your test. A PET-CT scan is a safe test for most people. But like all medical tests it has some risks. Your doctor and radiographer make sure the benefits of having the test outweigh these risks. Pregnant women should only have the scan in an emergency. There’s a risk that the radiation could harm the developing baby. Contact the department beforehand if you are or think you might be pregnant. If you are breastfeeding, let the department know a few days before your appointment. They will let you know if you need to stop breastfeeding for a length of time after having the radioactive drug. You might need to store enough expressed milk for at least one feed. Rarely, people have an allergic reaction to the radioactive tracer. This most often starts with weakness, sweating and difficulty breathing. Tell your radiographer immediately if you feel unwell. There's is a risk that the radioactive tracer will leak outside the vein. This can cause swelling and pain in your arm but it's rare. Waiting for results can make you anxious. Ask your doctor or nurse how long it will take to get them. Contact them if you haven’t heard anything after a couple of weeks. You might have the contact details for a specialist nurse. You can contact them for information and support if you need to. It may help to talk to a close friend or relative about how you feel. For information and support, you can also call the Cancer Research UK nurses on a freephone number 0808 800 4040. The lines are open from 9am to 5pm, Monday to Friday.